"Legacy mode" bindings are always available for any game. Even games that support native Steam Input actions still allow the player to mix in legacy mode bindings in the configurator. Through legacy mode, you can rebind any input on your controller to any emulated system input -- mouse, keyboard, or gamepad (ie, XInput events). To apply an emulated input, simply click on the appropriate input. Available bindings include left, middle, and right mouse buttons, mousewheel up, mousewheel down, and two auxiliary mouse buttons (4 and 5). Available bindings are all the keys on a standard keyboard. Note that the inputs here are sent by scancode, so although the display here is a standard USA English keyboard, the input that is actually sent depends on your system language/keyboard layout. So inputs like "WASD" on the configurator layout will actually map to whatever keys are in the corresponding positions in your system layout. There are some known issues with this if you are using a layout other than the default one for your language -- e.g. Dvorak or Colemak for English. There can also be issues if the default layout for your language doesn't match what we expect (there are some known issues where the Polish one doesn't match the layout most games expect). In this case you must either fix the keyboard bindings in game, or in the configuration. All the typical gamepad buttons in the XInput standard (those that typically appear on an Xbox 360 / Xbox One controller) are available here. This lets you activate Action Sets or Action Set Layers that you have defined yourself. This is useful for games that have various different "modes" that you might want different control bindings for, such as "walking" vs "driving" vs "flying", etc. 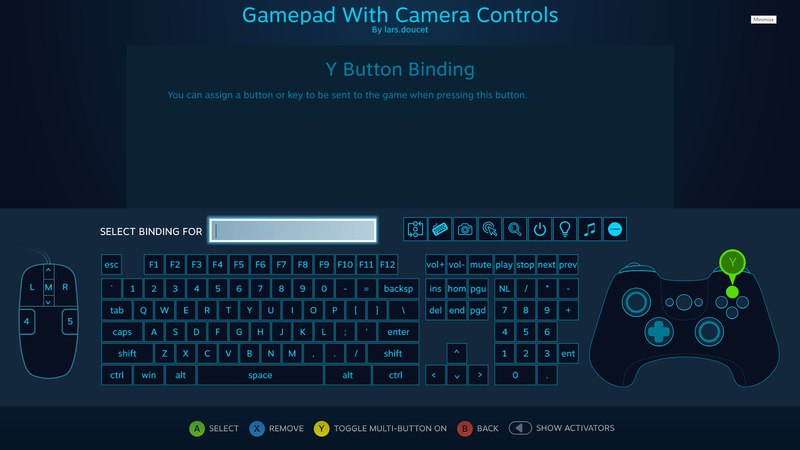 This brings up the on-screen virtual keyboard via the Steam overlay. This lets you generate a mouse click on a specific screen position as its own binding. For instance, if you need to click a particular button on a game's GUI that doesn't have an exposed hotkey of any sort. This is particularly useful in games like Papers, Please and Hearthstone -- check out this player's video as an example. Although Steam Input re-scales the mouse position proportionally with resolution, many games do not apply consistent proportional scaling to their GUI elements. This means that a cursor position binding that works in one resolution on a given game might not work in a different resolution because all the elements have moved around in unexpected ways. This toggles the operating system's magnification tool, zooming in on the current mouse position. Currently the only operating systems that support the magnifier are Windows and Steam OS. This lets you issue various system commands. 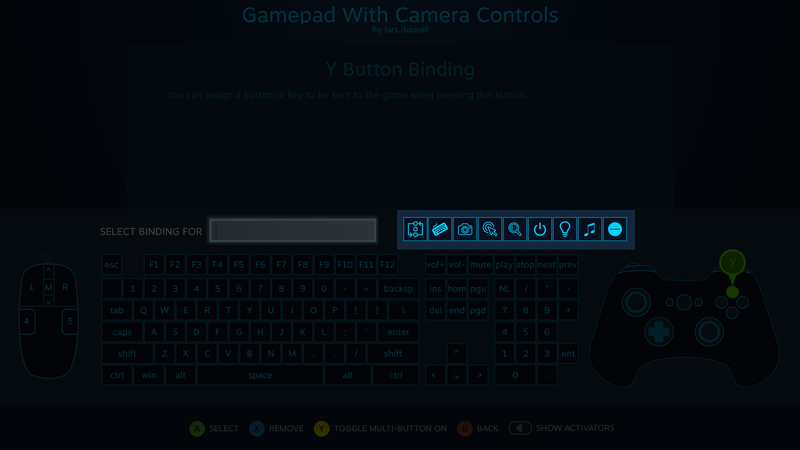 This lets you control how the controller's LED functions (if it has one). Only PS4 Controllers support colored light options. Slots 1-4 are colored red, blue, green, and purple, respectively. This lets you control music playback from your Steam music player. This does nothing, and is used for clearing out a previously selected special action.